Making headlines is the Hot Springs Five Ounce Silver Uncirculated Coin sell out and the fast moving American Silver Eagle bullion coins. Also, proof sets are back on top of the charts according to the latest United States Mint sales figures. "If a product becomes available due to an order cancellation, we will fulfill orders from the waiting list on a first-in, first-served basis." The Hot Springs coin debuted two weeks ago on April 28 with an order limit of one per household, and was at a near sell with 70% gone by the evening. Sales slowed after the first few days as is typical with most newly released US Mint collector products. 134 had remained by Sunday, May 8, and the final Hot Springs orders pushed against their mintage limit four days later. The US Mint ended the suspensions for all its silver sets late last week, and collectors ordered. The top numismatic seller, no doubt, was the 2011 Silver Proof Set at 4,831. The 2011 America the Beautiful Quarters Silver Proof Set followed at 3,303. The 2010-dated sets were not as hot comparatively, but still pulled in triple digit gains. Buyers picked up 796 of the 2010 Quarters Silver Proof Set and 687 of the 2010 Silver Proof Set. Silver commemoratives slowed in this round. The proof Medal of Honor coin was most popular, adding 1,960 to its total, while the uncirculated version’s total grew by 448. Previously, each leaped by 3,990 and 1,666 respectively. The proof US Army coin rose by 1,305 and the uncirculated increased by 385, after rising 2,393 and 819 in the prior report. In bullion products, US Mint Authorized Purchasers ordered 12,600 more of the Gettysburg and Glacier bullion coins as of Tuesday, May 10, leaving 5,600 up for grabs. Bullion American Silver Eagle sales shot ahead by the biggest leap in weeks. Buyers took 767,000 between Tuesday, May 3 and Tuesday, May 10. This month’s total is currently resting at 1,421,000 and the 2011 annual sales total landed at 16,669,000. *The Hot Springs coin actually reached a sell out on the morning of May 12. 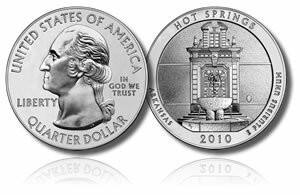 Sunday, May 8, is the "as of date" for all the US Mint collector coin sales figures shown above, and the Hot Springs issue is listed with sales as of that date for reference. Thursday, May 12, is the "as of date" for the bullion American Silver Eagle numbers. The sales figures include 469,500 of the 2010-dated Silver Eagles sold. Tuesday, May 10, is the "as of date" for the America the Beautiful Silver Bullion Coins sales.